For 14 years, through a webcam, we've been watching bald eagles Liberty and Justice raise their young above the D.C. Police Academy in Southwest. But now it appears this longtime Washington power couple may have broken up. 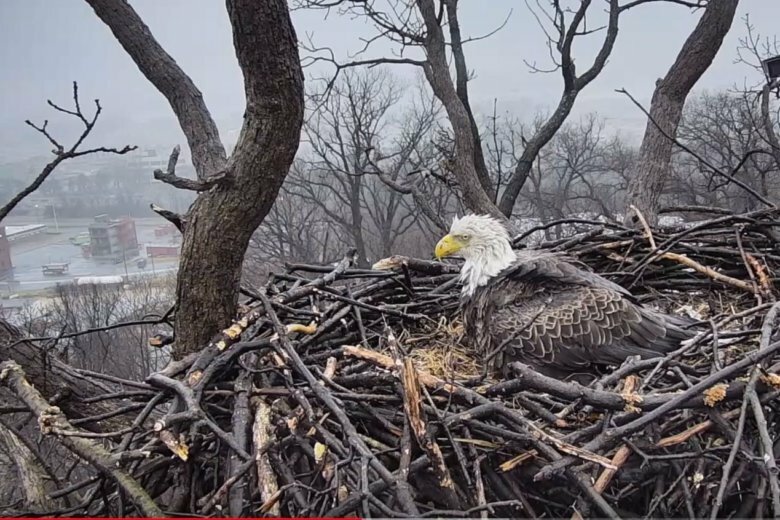 WASHINGTON — For 14 years, through a webcam, we’ve been watching bald eagles Liberty and Justice raise their young above the D.C. Police Academy in Southwest. But now it appears this longtime Washington power couple may have broken up. Liberty, the female, laid an egg on Tuesday. But the male, Justice, hasn’t been seen at the nest since Saturday. Meanwhile, a new male that’s been named Aaron Burrd has appeared. He has scratch marks on his talons, so it’s assumed he fought Justice, and possibly Liberty, too. “It’s kind of like the Lion King. With bald eagles what generally happens is two males will fight over territory, and then if a new male comes in and beats the male that’s currently in that area, then that male that loses has to leave the area,” Lawrence said. But if that’s what happened, it’s not a sure thing that Liberty will mate with the new guy. “Aaron Burrd would have to still court and win over Liberty’s love. It’s not like he beats Justice and Liberty automatically falls in love with him. He still has to go through the ritual and Liberty still has to accept him,” said Lawrence. Lawrence is asking people to help them try to locate Justice. If you see a bald eagle in Southeast or Southwest D.C., get as close of a photo as you can, and send it to raptors@earthconservationcorps.org. Then there’s the question of the egg. Who’s the father? “Based on time frame and everything (it) would actually be Justice’s egg,” Lawrence said. But Liberty typically lays two eggs per season. “It’s possible that a second egg will be laid (Friday) or Saturday, and if that does happen it’s most likely also Justice’s egg. However, if we go past this Sunday, then it’s most likely not going to be any of Justice’s offspring,” said Lawrence. There is a concern that the new male could potentially become aggressive toward the other male’s egg, or eaglet. But Lawrence said Aaron Burrd has been seen alone in the nest with the egg without harming it. All these developments, said Lawrence, have led to a “tremendous spike” in webcam viewers, and how the drama plays out, remains to be seen. “We look at it as, it’s nature. We’re lucky to be viewing this camera, and so we won’t interfere in any way,” he said. Watch the drama as it unfolds.